This has nothing to do with any vampires or neck biting. It will however be a summer friendly meal…usually cooked on the grill…that you can enjoy on the long, lazy summer nights! So last week we had Sesame Pulled Pork Lettuce Wraps. And I had another pound of pulled pork left (that I put in the freezer). As I was rummaging through the freezer, I found a bag of frozen sister schubert’s rolls that I bought right before heading off to NYC. 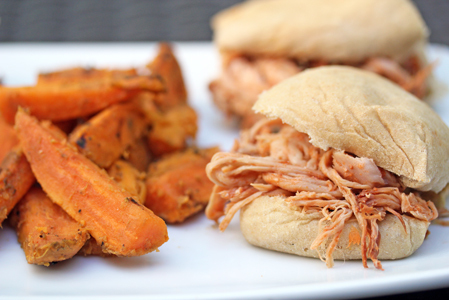 Tonight it’s BBQ Pulled Pork Sliders and Grilled Sweet Potato Fries! Cook or warm up your pulled pork. Add some BBQ sauce and throw the mixture on some rolls. Super easy and delicious! What are y’all biting on this fine Friday nite?! where is the recipe for the bbq pork sliders? Our family has gone slider crazy lately! Will try these soon! Cathy – Click on the link for Sesame Pulled Pork Lettuce Wraps, the original BBQ pulled pork recipe is there. Will try these this weekend.1I found this site last week and have made 3 recipes so far. This is my new favorite spot. Keep up the good work Erin!